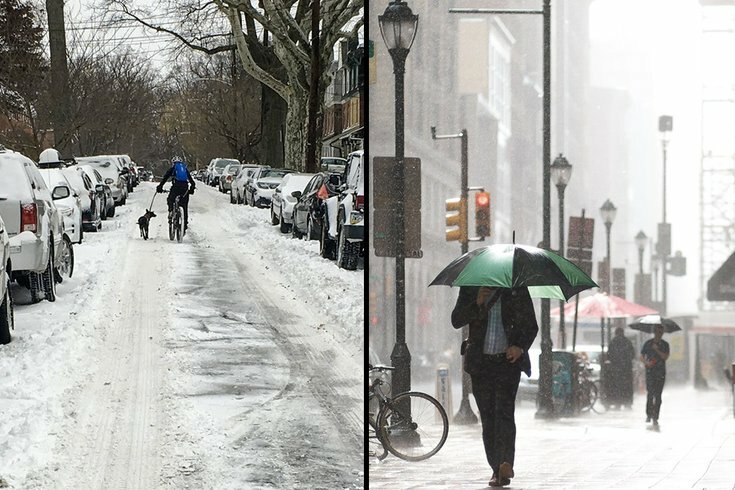 Coastal storm looks to bring a lot of precipitation next week – but snow, rain or both? A lot of precipitation in the forecast for next week, but forecasters not sure if it will snow or rain, or both. The spring dance with Old Man Winter is still on. Forecast models are continuing to suggest an East Coast storm will form next week and recent trends indicate one factor that could lead to more precipitation and heavier winds than originally thought, according to the National Weather Service in Mount Holly. But the weather service says they don't know yet whether that precipitation will be snow or rain, and probably won't have higher confidence about that and any possible accumulations for a couple more days. Forecast models are trending toward a low pressure system from the Central Plains to track farther south and east, with secondary development off the coast of North Carolina on Tuesday. That track would bring a colder and possibly snowier result, forecasters said. Precipitation will likely move into the area on Tuesday either as rain, snow or a mix of both. At this point, with less than high confidence, rain looks more likely along and southeast of the I-95 corridor with snow or a mix possible north and west of Philadelphia. Winds will also strengthen out of the northeast. Then Tuesday night into Wednesday, the secondary low appears to take over as it deepens and slows down near or just off the coast. This more sluggish movement could mean precipitation over the Philadelphia region through much of Wednesday. Again, it's up in the air right now on whether its rain or snow. There remains a chance for conditions that favor mainly snow Tuesday night into Wednesday. Still, forecasters note, wet snow during daylight hours at this time of year probably would have a difficult time accumulating? The storm should finally move north and east to the upper Mid-Atlantic and New England by Thursday with precipitation ending but cool temperatures lingering. So don't count on a big warm-up next week. Friday: A slight chance of snow showers before noon, then scattered rain and snow showers between noon and 2 p.m. Mostly sunny, with a high near 43. Breezy, with a northwest wind 15 to 20 mph, with gusts as high as 31 mph. Chance of precipitation is 30 percent. Little or no snow accumulation expected. Friday night: Mostly clear, with a low around 27. Northwest wind 7 to 14 mph. Saturday: Sunny, with a high near 48. West wind 8 to 13 mph. Saturday night: Mostly clear, with a low around 28. North wind 6 to 8 mph. Sunday: Sunny, with a high near 46. Northwest wind 5 to 8 mph. Monday: Sunny, with a high near 46. Monday night: A chance of rain before midnight, then a chance of rain and snow between midnight and 3 a.m., then a chance of snow thereafter. Partly cloudy, with a low around 31. Chance of precipitation is 30 percent. Tuesday: Snow likely before noon, then rain and snow likely between noon and 3 p.m., then rain likely thereafter. Mostly cloudy, with a high near 42. Chance of precipitation is 70 percent. Tuesday night: Rain and snow likely. Mostly cloudy, with a low around 32. Chance of precipitation is 70 percent. Wednesday: Rain and snow likely. Mostly cloudy, with a high near 41. Chance of precipitation is 60 percent. Wednesday night: A chance of rain and snow showers. Mostly cloudy, with a low around 31. Chance of precipitation is 50 percent. Thursday: A chance of snow showers. Partly sunny, with a high near 44. Chance of precipitation is 40 percent.